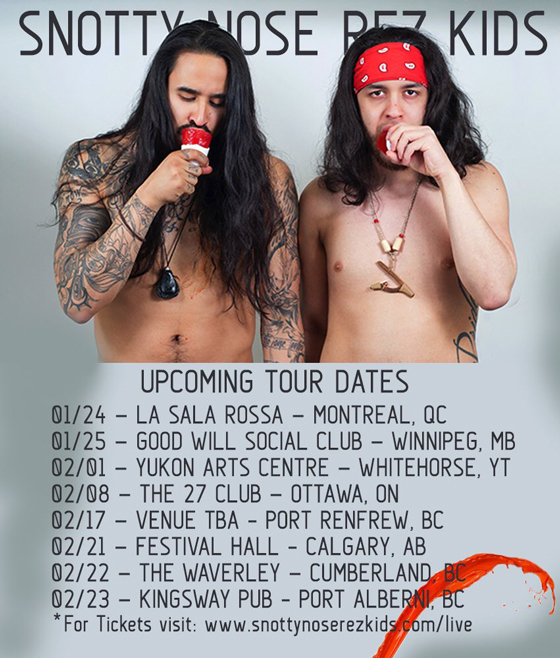 Set to build on a year that saw them shortlisted for the 2018 Polaris Music Prize, Snotty Nose Rez Kids have mapped out a Canadian winter tour. The eight-date run will begin at Montreal's La Sala Rossa on January 24. From there, a date in Whitehorse will break up festival stops at Winnipeg's Big Fun Festival and Ottawa's MEGAPHONO. A Western Canadian swing will feature shows in Port Renfrew, Calgary, Cumberland and Port Alberni in February. You can find a can find a complete itinerary below and further ticketing details here. Snotty Nose Rez Kids are expected to deliver a new album titled Rez Bangers & KoolaPops through RPM Records. Read our 2018 interview with the duo here.